So, I drove my 26 coupe through the drive through at McDonald's today as I often do and as I was leaving the parking lot the engine died. I flipped the switch to battery and the engine immediately free started again and ran perfectly fine. When I flipped the switch back to mag the engine died again. I started to drive back home on battery. After a couple minutes I tried my mag horn and was surprised to find that the mag was working fine again. I switched back to mag and the car ran fine all the way back home.I checked all the electrical connections associated with the magneto and didn't find anything wrong. The mag terminal didn't have any lint on it. Thinking something may have come loose inside the engine and temporarily shorted the mag out, I started the engine and let it run with the spark retarded to hear a little better if something was flinging around inside the crankcase. Sure enough as I was lying under the car I heard something hitting the inside of the pan. I drained the oil and found this stuck to the magnet in the drain plug. I pulled the cover on the bottom of the pan but, found nothing wrong. I'm thinking it's probably a piece of one of the brake drum lug shoes because about a month ago the clutch started making a clunking noise when I shift into high whereas it was perfectly smooth and quiet before. I guess I'll be pulling the engine in a little while to see what happened. Can we see a picture of the piece on the drain plug magnet? Been there done that. I had one of those take out a low drum and a clutch. If a simple tear down and lug replacement is all you have to do count your blessings.The lug shoe problem can really be nasty. I'll post a picture when I get home tonight. I got very lucky...I hope you do too! There was apparently a run of brass magnet clamp screws sometime in the mid 1970�s that the heads are more likely to pop off of. 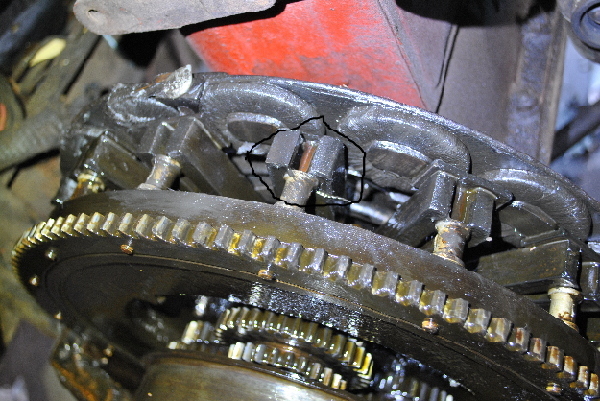 There was a run of brake drum clutch lug shoes around 2005 that had the grain of the metal in the wrong direction and are known to fracture. It's interesting the repro parts that fail for want of engineering detail that was "built in" to the Ford parts. Re/ the brass clamp screws that lose their heads, are those the ones threaded all the way to the taper on the head ? I also wonder about different "flavors" in bronze alloys . . .
Adam, as far as I know the lug shoes in my car are original. I can't be sure though as I bought the brake drum from somebody and the lug shoes came with it. All of my magnet keeper plates were intact when I took a peek at them through the starter hole so hopefully none of the magnet screws are broken.